Yachting World's Top "New Gear of the Year"
Find out what Yachting World claimed is "the best tender toy you've never had"
Harken gets kids into foiling, parents get driven nuts! With no boat even remotely similar to the proposed foiling monohulls in the next Americas Cup, how are the sailors supposed to be training? 55 Sabres swarmed the Swan as the 40th Sabre Nationals got underway on 30th December and run through to the 4th January 2018 at Perth Dinghy Sailing Club on Matilda Bay. Tips for Wild Oats XI (and you!) How to Avoid Protests! Sometimes it's worth it, other times, it's not. 'That' call by Wild Oats Xi, was not, and it cost them the race. Unidentified Foiling Object coming to Australia! Everybody can foil with the 3.3m UFO from Fulcrum Speedworks. And now they're coming to Australia. Not only is this some of the most incredible sailing you will see, it's certainly the most unconformable. With freezing cold water, huge swell and constant spray in the your face. Up close and tactical racing from the Volvo Ocean Race, in South Africa's Big Bay. This racer/cruiser might revolutionize interior layouts! Truly revolutionary for the sport of sailing and promising faster speeds, safer sailing and more exciting races. These foiling monohulls will change sailing. Meet the New Breed of Round The World Sailors. They're young, they're fearless and they're LIVE on the internet! Has the Americas Cup, the Volvo Ocean Race or the Extreme Sailing series piqued your interest in the sport of sailing? Red Bull have made the ultimate introduction to the sport, which will inspire you to book your first sailing lessons straight away! Not since 1983, has the new York Yacht Club challenged an Americas Cup. That was the year Australia II won, so there's going to be quite the challenge put up in the 36th Americas cup! It's the beginning of the season in the French Riviera, and to kick it off, the Cannes Yachting Festival attracts the industries latest, best selling and most extravagant. There's no rivalry more fierce than that between QLD and NSW at State of Origin time. Except for anything between Australia and New Zealand. Could 2021 be the comeback of an Aussie contender in the Americas Cup? Extreme conditions break Americas Cup Boats! With winds pushing the 30 knot mark, the Americas cup contenders were doing everything they could to keep their boats upright this week. A Beginners Guide to Hydrofoils and Foil Shapes in the AC. Hydrofoils are both simple, and more complicated than you could ever imagine! Get the gist of how they work in this article. With all the mod-cons of a cruiser, and all the performance of a racer (and more!) Pro Snowboarder Travis Rice wanted to exprience the action for himself. Volvo Ocean Race to trial Foiling Multihulls! Why let the Americas Cup have all the fun? Next year the Volvo Ocean Race will be running with two boats, and BOTH have hydrofoils. Cheap, modern, and oh-so-cool. The foiling O'Pen BIC concept is here, and kids everywhere want one. Even Gusts of 142kts Won't Stop Hammo Race Week! Australia's Largest Offshore Regatta will be continuing in 2017, with operations on Hamilton Island expected to be running at 100% by August. A very (very!) near capsize for Oracle Team USA, and disaster for Artemis Racing, who lost a brand new wing sail this week in Bermuda. When you're sailing space-age boats that fly, you need something a little more advanced to protect you than an old Type 2 PFD. 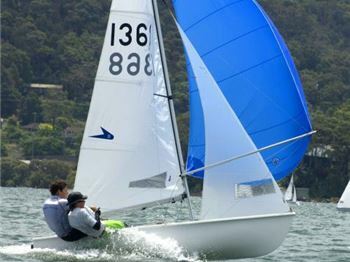 The final heats of the WA Sabre State Championships were hosted at the Perth Dinghy Sailing Club on the 11th March. The Best Dinghy Choice for Junior Sailors - Flying 11! With strong fleets, cheap running costs and simple sailing characteristics, the Flying 11 is a perfect boat for young sailors transitioning out of Sabots or Optimists. More than a month after the first racers crossed the finish line in the Vendee Globe Ocean Race, Conrad Colman finally finished last night after losing his mast and constructing a jury rig. It's the biggest development in Americas Cup Sailing since Hydrofoils, but will other teams bother to replicate the pedal powered Kiwi cat? These Low Tech Racers just finished the Best Race Ever! Seven teams set out on a 500nm journey in traditional Ngalawa's. Made from Mango tree's, for the 2017 Ngalawa Cup. While you might think the 'Cup contenders are 'Super Yachts'. The REAL kind of Super Yacht is coming to Bermuda too, and these old girls might just steal the show! With the 2016/2017 Vendee Globe finishing this week, and the first three boats being of the flying type, the future of Ocean Racing is clear. Better to be safe in the marina wishing you were out there, than to be out there wishing you were in the Marina! It's neck and neck for the Sydney to Hobart! 100ft Maxi Sails Between Spectator Boats- only cm to spare! During the start of the CYCA's Big Boat Challenge, the 100ft Maxi Scallywag had to squeeze between two spectator vessels, with mere centimeters to spare! The Sailing World Loses a Legend. Paul Elvstrom. He was know for his book. His courses. His legendary tactics. But mostly, Paul Elvstrom was known as a great sailor. This years Vend?e Globe is taking sailors to new heights - literally! Wing sails are fast, but when they go boom - boy do they go!!! The WA Sabre Fleet has just finished up their inaugural Opening Day Series. The series was held to promote Sabre sailing in WA and support Sabre yacht club opening day events. Sailing Around the World In 10ft - Update! With three carbon fiber masts reaching 900ft in height, and NO stays, this superyacht is just as incredible, as it is ugly! Team NZ? They're "goin' OK" for the Americas Cup. In Glenn Ashby's famous Aussie style, he says the Kiwi Team is going great guns with their in house designed and built AC45 - and this video proves it. On a windy day, out on a dry lakebed, one guy sat in a three wheeled buggy with a GPS taped to his handlebars. That guy was doing over 100kmph, powered by nothing but wind, and it looks just as fast on camera as it would have in real life. This is what happens when a gymnast goes sailing on a Nacra. Ever tried standing on foot while you're out on trapeze? This woman takes it to a whole new level! You know how much it hurts when you kick a cleat with bare feet, so imagine what Tom Slingsby is feeling after getting thrown at a winch handle on board Oracle Team USA! The age of cabin class foilers is here! Will the F4 top the G4 and bring foiling to the owner/racer/cruiser market? We'll find out soon once the boat begins its trials in the US. How does this guy fit his boat through there!? Along the coastline of Croatia, lie over one thousand islands. This guy, can fit between all of them, right down to their individual rocks, in his little dinghy. Gold. Silver and Jib Only Racing in Rio! Mixed Crew. Fast Speeds. Understandable Races. The Nacra 17 is winning fans worldwide at the 2016 Rio Olympics. Comanche smashes Transatlantic Record - 5days 14hrs 21min! Breaking a 13 year standing record set by one of the fastest monohulls of all time, Comanche has just crossed the Transatlantic in a touch over 5 days. Foiling Catamaran Slices RIB in half! While racing on Lake Garda, a GC32 has t-boned a photography RIB while in full flight. Luckily, nobody was hurt. New Route for Volvo Ocean Race - More Miles, Less Time! The route for the 2017/2018 Volvo Ocean Race has been released, and it will see sailors sailing further, in less time than ever before. 32 kids under the age of 15 will compete in the Americas Cup next year, during the half time entertainment on the final day of racing. The boats they'll be sailing? O'Pen Bics! These kids go surfing in their O'pen Bic's! High wind blasting, surfing hawaiian waves; these boats might only be 9ft long and sailed by kids but they're incredible to watch! Man sailing around the world with his pet CHICKEN! A French man is part-way through a multi faceted adventure in the arctic, and along for the ride is his pet chicken Monique. They're going to break some records, write a children's book and have a lot of fun together.